Many people are searching for zucchini recipes this time of year. 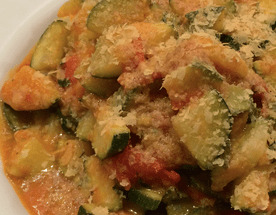 In this episode I discuss using those summer zucchini in a simple stew with tomatoes, onions, garlic, herbs…lovely stuff. Makes a perfect side dish or bed for other items. We often make this in summer and it can be used in many ways such as a pizza topping, mixed into a simple pasta dish. I hope you enjoy these zucchini recipes and ideas.